Maintains ideal working temperature of both strip and hard waxes for exceptional results. 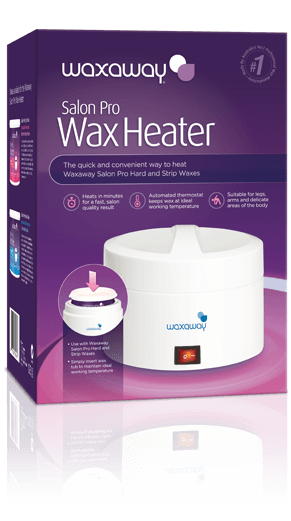 Waxaway’s Salon Pro Wax Heater is the quick and convenient way to heat Waxaway Salon Pro Hard and Strip Waxes. The Salon Pro Wax Heater is compact, portable and light weight, making it ideal for mobile therapists and the at-home user. Use only with Waxaway Salon Pro Strip and Hard Waxes. 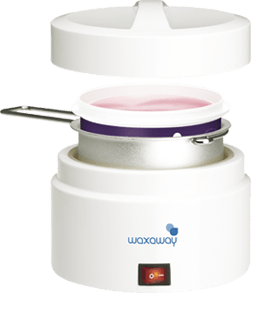 Simply microwave the wax, then insert wax tub to maintain the ideal working temperature. There’s no mess, no fuss! 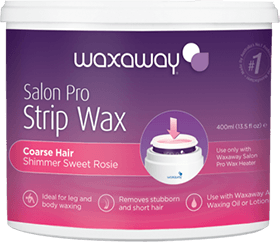 Heating in minutes for a fast, salon quality result that lasts up to 4 weeks, Waxaway Salon Pro waxes are suitable for legs, arms and delicate areas of the body. With an automated temperature control, the Waxaway Salon Pro Wax Heater makes waxing easy! No Mess, No Fuss Heating! Say hello to silky smooth skin without redness and irritation! Based on Australia’s most popular salon professional formula, Creme Berry Twist is a hypoallergenic wax containing Titanium Dioxide to actively reduce skin redness and irritation. With a delicious blueberry aroma, it is perfect for waxing sensitive sensitive and delicate areas of the face and body as well as mature skin. This microwavable hard wax is highly flexible, easy to use and removes both fine and coarse hairs effectively. No strips are required, simply remove with fingertips. This gentle and flexible wax glides onto the skin smoothly, making it perfect for waxing all skin types. Ideal for use on larger areas of the body such as the arms and legs, it removes short and stubborn hairs quickly and effectively.